There’s a new exhibit at the University of Texas’ Briscoe Center for American History: a statue of Confederate President Jefferson Davis that was removed from the campus’ main mall in 2015. It represents an enormous missed opportunity for the university to confront the role that racism and white supremacy played in UT-Austin’s history. Unfortunately, the Briscoe exhibit narrowly focuses on telling the story of the statue itself, chronicling debates over whether sculptor Pompeo Coppini used the correct proportions, and threats from his lawyer to sue the university over delayed payments. The statue is wrenched from its historical context and treated as an aesthetic object. 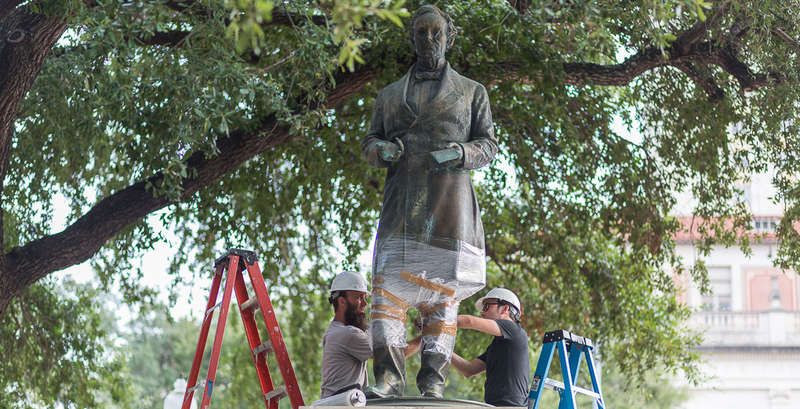 There is no acknowledgement of what confederate officer, cattleman, banker and longtime UT benefactor George Littlefield intended when he commissioned this statue and five others on campus: to celebrate white supremacy and embed it into the very landscape of UT-Austin. True, there is no written statement by Littlefield saying this. But consider the six men this former UT regent chose to commemorate with statues: Davis, president of the Confederacy; Robert E. Lee and Albert Sidney Johnston, confederate generals; John H. Reagan, architect of black disenfranchisement after Reconstruction, from poll taxes to literacy tests; James Stephen Hogg, the Texas governor who signed the first Jim Crow bills into law in 1891; and Woodrow Wilson, the first post-Civil War southern president, who removed blacks from positions of power in the federal government, segregated the federal bureaucracy and refused to involve the federal government in defending black civil rights in the face of white terrorist violence. These are not “character flaws” — they are the very reasons Littlefield chose these figures to commemorate. They were chosen because they represented the ascendency of white supremacy, not in spite of it. And what about the larger historical context? 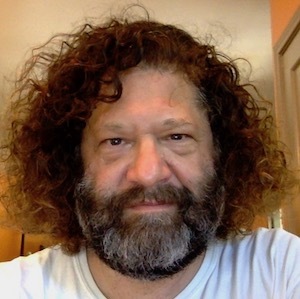 At the time Littlefield was conceiving of his memorial to the Confederacy, white supremacy was resurgent: Segregation was being formalized, blacks were being disenfranchised and there was a steep rise in white-on-black terrorism. It was during this period that nostalgia for the Old South was promoted through a new interest in commemorating the Confederacy. The Coppini statues, most of which remain on campus, are part of this movement — and Littlefield was one of its major architects. There is, in fact, clear documentary evidence in the Briscoe holdings that helps us understand this context — though it’s not featured in the exhibit. Littlefield is to no small extent responsible for making Davis a figure of reverence across the former Confederacy. Chief among Littlefield’s projects, after his work at UT, was the memorial to Davis in Fairview, Kentucky, Davis' birthplace. Littlefield was chairman of the board of the Jeff Davis Home Association, the organization responsible for building that memorial, and he made the largest financial contribution to it, over $48,000 (about $750,000 in today's dollars). He worked closely with Bennett Young, another confederate veteran and president of the Jeff Davis Home Association. There are many letters in the Briscoe collection between Littlefield and Young about the memorial. From reading them, it is clear that Young and Littlefield were the driving forces behind the effort to memorialize Davis. Despite Littlefield's generous contribution, they were having trouble raising money to complete the monument. In a letter dated March 13, 1916, Young confessed to Littlefield the reason why they were having such trouble: "Because — I may say to you what I would not say outside — that Mr. Davis was never popular in the South and it was difficult to excite and evoke enthusiasm in regard to things which affect him." This confession is significant because it shows that Littlefield and Young were not merely building a monument to reflect admiration for Davis across the former Confederacy, but to create such admiration. Littlefield and Young were instrumental in helping to create the myth of Davis as a great statesman worthy of admiration. From these documents, and many others in the Briscoe collection, it is clear that Littlefield’s driving motivation for the memorials that he helped create — including the Coppini statues on campus — was a celebration of white supremacy in the context of deepening racial segregation, including the exclusion of African Americans from many benefits of citizenship, such as admission to UT. By charging the Briscoe to focus its “educational” exhibit exclusively on the Davis statue itself, the university further mystifies the history of racism in this country, which can only perpetuate its most pernicious effects.